The purpose of a shutter is to control the amount of light reaching the image sensor. Back in the days of film, mechanical shutters were the only option and there were only two types: focal plane and leaf. 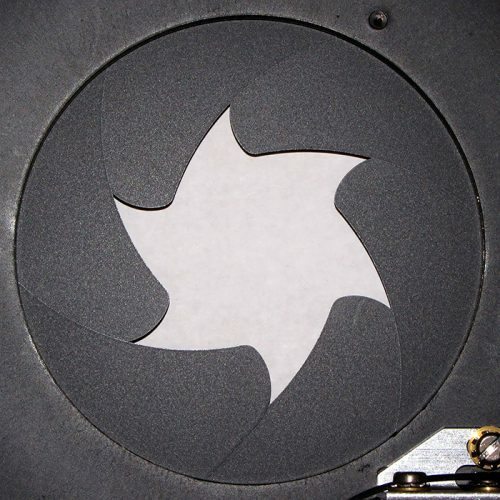 Focal plane shutters were used in SLR cameras, while leaf shutters, named for their leaf-shaped blades, were generally integrated into the lenses for rangefinder cameras. To some degree this distinction has persisted into the digital age, but with the arrival of mirrorless cameras it became possible to include three more types: ‘rolling’ shutters; hybrid shutters (which combine mechanical and electronic operation); and ‘global’, fully electronic shutters. With a mechanical shutter, closing a blind or blades blocks the light, while opening them allows light to pass to the sensor. The time the shutter remains open is known as the ‘exposure’. Being located just in front of the image plane, focal plane shutters work with all lenses. They consist of two travelling ‘curtains’ that open to let a slit of light through. 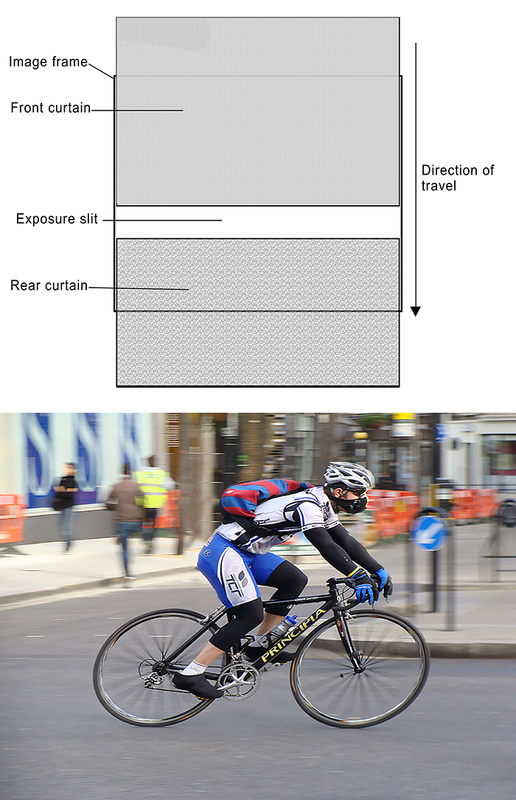 The width of the slit and the speed at which it travels control the exposure time. In older cameras, the curtains moved horizontally across the frame. In modern cameras, the curtains move vertically, allowing faster shutter speeds because the distance they have to travel is shorter. Vertical-travel shutters can support shutter speeds as high as 1/8000 second, which is much faster than leaf shutters. A vertical travel focal plane shutter exposes a sensor with a moving slit that lets light through. 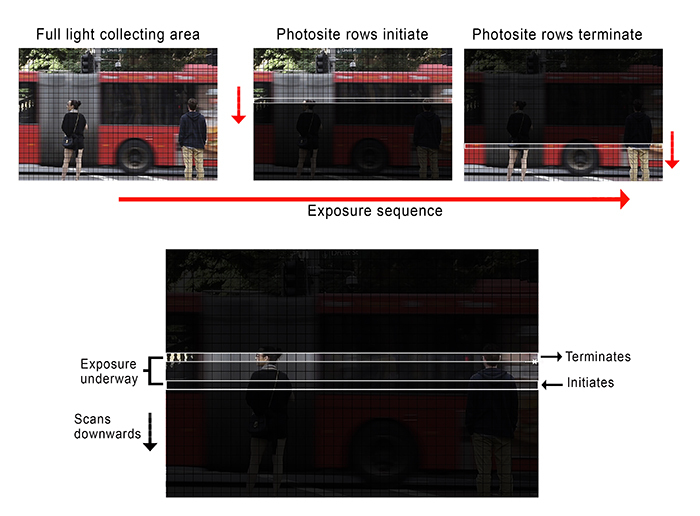 Focal plane shutters can cause moving subjects to appear skewed to one side as they only expose part of the frame as they travel, as shown in the picture below the diagram. Leaf shutters are similar to the iris diaphragm blades that control the lens aperture. They open and close in a circular motion and are usually contained within the lens. Structurally, they are complex but they expose all of the sensor at the same time. This allows flash synch at shutter speeds up to 1/500 second, compared with 1/250 second for the best focal plane shutters. A typical leaf shutter partially open. Note the curved blades that pull back to deliver light all over the frame. Being more complex, leaf shutters are more expensive to produce and less reliable in operation than focal plane shutters. Their fastest shutter speeds are limited due to a lag between opening and closing the shutter. However, they can synchronise flash at all shutter speeds, are quieter than focal plane shutters and don’t distort moving objects. At fast shutter speeds, leaf shutters can cause vignetting, as the central part of the image can get more light than the edges. And because each lens requires its own shutter, the range of focal lengths and maximum aperture options available is a limited. For these reasons, they are seldom used in modern digital cameras. Both types of mechanical shutters have moving parts, which over time can suffer from wear. The shutters in more sophisticated cameras are usually ‘rated’ for a number of cycles, with a typical figure for professional DSLRs being somewhere between 200,000 and 300,000 cycles. The shutters in mid-level DSLRs can be rated for between 100,000 and 150,000 cycles, while even without a published rating the average entry-level DSLR’s mechanical shutter should be good for at least 50,000 cycles. Information on finding how many times your camera’s shutter has actuated is provided under the “Discovering shutter actuations” heading below. There are two types of electronic shutters – rolling shutters and ‘global’ electronic shutters – plus a hybrid type that combines mechanical and electronic operations. Both rolling and global shutters are controlled by the sensor itself. Their main advantages lie in the fact they have no moving parts, which means there’s no wear and tear through multiple actuations. Without moving parts, these shutters are immune to shutter shock and can also operate silently. They can also achieve very fast shutter speeds, with 1/16,000 second relatively common in current mirrorless cameras and some going as high as 1/32,000 second. This is at least twice as fast as the top speeds of the mechanical shutters in flagship DSLRs. A rolling shutter scans across the image plane (usually downwards), ‘initiating’ and ‘terminating’ rows of photosites in rapid succession as the frame is fully exposed. A rolling shutter activates one row of photosites at a time across the width of the frame. The exposure takes place between the time the first row of photosites is illuminated and when the last row of photosites is shut down. In some cameras, this can take as long as 1/10 second, although in the flagship mirrorless cameras from Olympus, Panasonic and Sony it is closer to 1/60 second. Either way, it’s similar to the speed of a slow mechanical shutter, even though the actual exposure time for each row of photosites is as brief as 1/16,000 second. Most of the delay is due to the readout time: the time taken for all of the data to be transferred from the sensor, which is also influenced by the available processing power. A millisecond delay between when the pixels are shut off at the top of the sensor and when they turn off at the bottom introduces distortion, producing a ‘rolling shutter effect’, which is common in video recordings. The scene at the top shows the area across which the camera is panned. 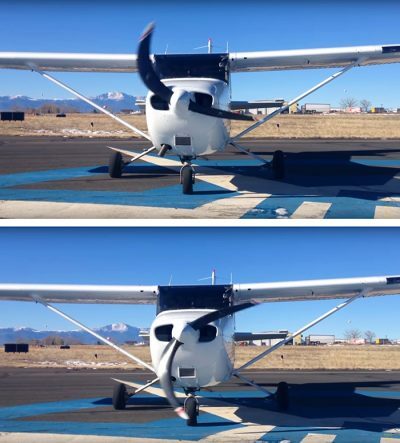 The two frames below show the skewing caused by the rolling shutter. Once the camera stops moving, the skewed subjects will snap back to vertical. Usually the rolling shutter process is fast enough to be unnoticeable in movie clips, although it can be visible in rapid pans and with fast moving subjects like propellers. Rapid pans will make the recorded image appear to wobble (hence the name ‘jello effect’), causing images to become skewed, as shown in the illustration on this page. Two frames from a video clip of a rotating propeller showing the rolling shutter effect. This is magnified for fast-moving objects like propeller blades and will often show up in still photos. They can also suffer from severe banding when shooting under fluorescent lights. Hybrid shutters combine a mechanical and a sensor-based shutter. A rotary mechanical shutter is placed in front of the sensor to obstruct light when the sensor would otherwise be initiating or completing each exposure. If the rotary shutter is faster than the sensor more of the sensor is exposed for capturing light. Adding a mechanical shutter to a digital sensor adds potential for vibrations and noise. With both rolling and hybrid shutters, the bit depth of raw files can be reduced to enable fast enough readout speeds. In addition, they don’t work well with flash. The flash illumination must cover the entire frame for the time it takes for all the rows of pixels to be activated, which limits the supported shutter speed range. The different operations of ‘hard’ and ‘soft’ global shutters. Global electronic shutters (sometimes known as e-global shutters) have been developed to address these problems. Instead of turning pixels off in a cascading sequence, they deliver incoming light to all photosites simultaneously. A ‘hard’ shutter works by abruptly exposing and then obstructing all photosites at once, while a ‘soft’ shutter does this more gradually. Either way, everything within each frame is recorded simultaneously. Unfortunately, global shutters require sensors with very high read speeds in order to capture the exposure. This is more difficult with large sensors than with smaller chips, which is why global shutters are most common in cine cameras. They are also being used in an increasing number of mirrorless cameras, particularly those with M4/3 sensors. While they are ideal for recording rapid events such as gunshots and explosions, global shutters have some limitations. Low light shooting at high ISO settings is limited by the space required at each pixel site for the electronics to ‘flash’ the entire sensor at the same time. Dynamic range is reduced as a consequence. 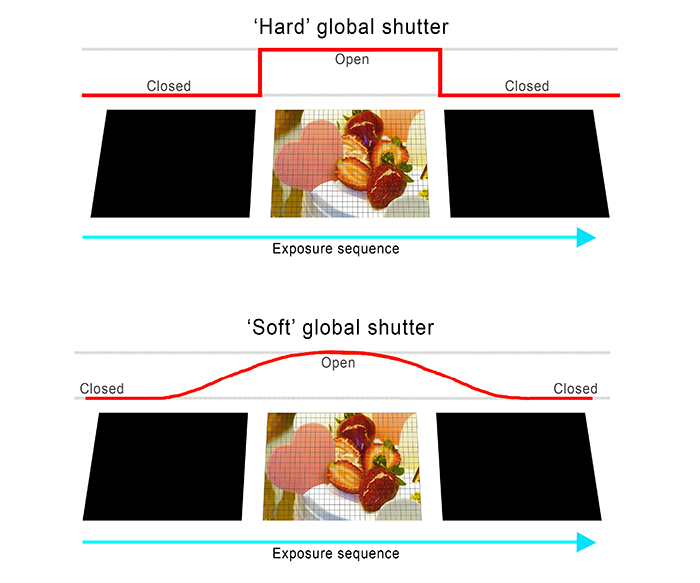 While most cameras with hybrid shutters give users a choice between the mechanical and electronic shutter – as well as an Auto option where the camera’s microprocessor decides – it’s useful to understand the kinds of tasks each type of shutter does best. Mechanical shutters are the best choice for flash photography and also when shooting under fluorescent lighting (or any other flickering light source). They are also preferable if you’re shooting raw files and want to maintain the maximum bit depth or when you are using wide apertures and want to maintain a soft, undistorted bokeh. A fast rolling shutter is well-suited for movie recording, since this has been the standard for over a century. But beware of panning rapidly and avoid very fast-moving subjects to minimise ‘jello effect’ distortions. A global shutter will provide the most accurate representation of motion for both movies and still photographs, particularly with very fast-moving objects. It will also support silent shooting. But stills photographers should be aware that it can reduce the bit depth of raw files from 14 to 12 bit, resulting in lower dynamic range. If you’re selling a DSLR or contemplating the purchase of a secondhand one, it can be handy to find out how much it has been used and how close the shutter count is to the rated figure. This is possible with some cameras, although a few brands aren’t supported and there’s no guarantee any of the methods listed below will work for any particular camera. Still, they are worth a try. The simplest way to find out how many times a shutter has been released is to upload a recent image to www.camerashuttercount.com or www.myshuttercount.com. Unfortunately, these online analysers aren’t up-to-date and only work for a few older models from Canon. But they cover quite a wide range of Nikon and Pentax cameras and a few SLT models from Sony. Instructions for discovering the shutter actuations for Olympus cameras as well as different Panasonic G-series models can be found at www.bit.ly/G-shutter-count. Between 10 and 15 steps are involved, with the Olympus instructions being shown in a video clip. 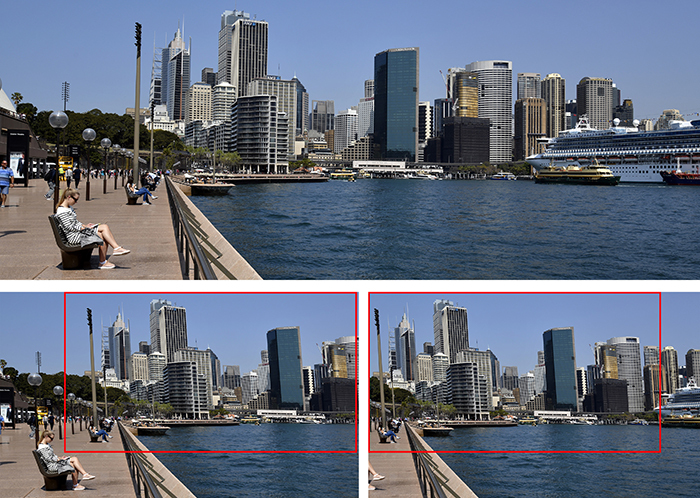 Users of Sony Alpha cameras could try the online tool at http:/tools.science.si/index.php. Cameras supported include the original models in the α7 series plus some Gen. 2 models; most NEX models plus some of their successors; and some Alpha DSLRs. Some camera manufacturers embed the number of shutter actuations in image EXIF metadata but you will need a reader that can display ALL of the data to find it. 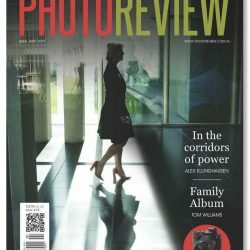 Phil Harvey’s ExifTool (download from www.bit.ly/PH-Exif-Tool) or Opanda iExif (www.bit.ly/Opanda-IExif) are the recommended multi-platform Exif tools to use. Once you’ve downloaded the software, select the most recent JPEG file you’ve taken and open it. Then scroll down the Exif table until you find an entry for ‘Shutter Count’ or ‘Image Number’ in ExifTool or ‘Total Number of Shutter Releases for Camera’ in Opanda iExif to find the number you’re looking for.